Every year between October-December... 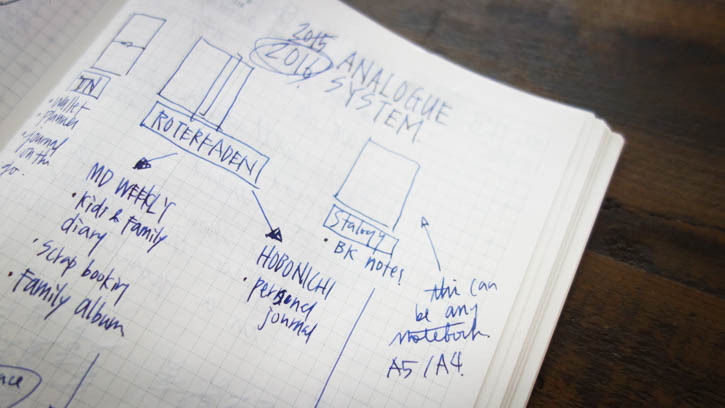 I spend a lot of time thinking and imagining what my next year's analogue system look and feel like. I LOVE this process every year as it gives me a chance to look back, reflect and dream how it could be... and it always ends up becoming a diagram so I can make sense out of the system. So this is what I am thinking about... for 2016!! Roterfaden: I am going to make some changes with Roterfaden. I am hoping that it will become my personal hub for reflection. I am planning to carry 2 notebooks in my Roterfaden Dark Brown Leather Cover. 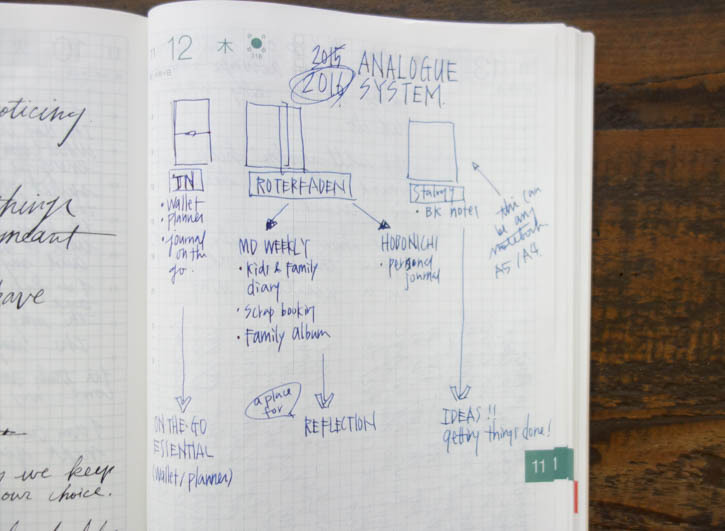 MD 2016 Monthly/Weekly notebook for documenting life with family and Hobonichi Avec for personal journaling. MD Monthly/Weekly notebook will probably be thicker as I am planning to put tons of pictures and additional collaging to make this notebook become our family archive of memory... and I am hoping to keep my Hobonichi Avec slim mainly just with words. I LOVE that Roterfaden will help me streamline the number of notebooks I will be carrying. Stalogy 365: For Baum-kuchen notes and ideas. I am going to keep the format of this notebook flexible. Who knows... maybe after finishing the last page of this notebook, I will move into A4 format for more space! I am totally open for what feels right when I finish this notebook! I really loved reading this! I will also be making some changes to my system for the upcoming year. I used to keep a gratitude list in a dedicated notebook insert in my midori passport, but have decided to integrate my lists on my daily pages (refill 005) in my regular TN. That way I can make more use of the large daily spaces, and my passport will be thinner. The last is essential, as I want my PP to double as my wallet. I’m still debating about my personal journalling. I tend to include photos and little snippets. I’ve been using a booklet in my PP (I can write really tiny when necessary … ;) ), but the booklets get fat. Maybe too fat for a wallet … So I’m contemplating including my journal in my regular TN. Oh, decisions, decisions. Yet, I love this brainstorming time at the end of each year!! !